A live-action Beauty and the Beast remake was first announced in April 2014, with Guillermo del Toro attached to direct. After he dropped out and Condon was hired to replace him, Watson, Stevens, Evans and the rest of the cast signed on between January and April 2015. Principal photography began at Shepperton Studios in Surrey, England in May 2015 and wrapped that August. With an estimated budget of around $255 million, it is one of the most expensive films ever made. Beauty and the Beast premiered at Spencer House in London on February 23, 2017, and was released in the United States in standard, Disney Digital 3-D, RealD 3D, IMAX and IMAX 3D formats, along with Dolby Cinema on March 17, 2017. The film received generally positive reviews, with many praising the performances of the cast (particularly Watson and Stevens), and its faithfulness to the original animated film, as well as elements from the Broadway musical, visual style, production values, and musical score, though it received criticism for some of the character designs and its excessive similarity to the original. The film grossed over $1.2 billion worldwide, becoming the highest-grossing live-action musical film, and making it the second-highest-grossing film of 2017, the tenth-highest-ever-grossing film in North America and the 14th-highest-grossing film of all time. The film received four nominations at the 23rd Critics' Choice Awards and two nominations at the 71st British Academy Film Awards. It also received Academy Award nominations for Best Production Design and Best Costume Design at the 90th Academy Awards. Dan Stevens as Beast, a cold-hearted, selfish, unkind prince who is transformed into a beast and forced to earn back his humanity by learning to truly love and be loved in return, as well as to give rather than take. Stevens portrays the character through motion-capture. Kevin Kline as Maurice, Belle's protective widowed father who works as a music box maker and an artist. Josh Gad as LeFou, Gaston's flamboyant and long-suffering sidekick who bolsters his friend's ego but gets very little in return. Ewan McGregor as Lumière, the Beast's charismatic bouteiller who has been transformed into a candelabra. Stanley Tucci as Maestro Cadenza, the neurotic court composer and Madame de Garderobe's husband who has been transformed into a harpsichord. Audra McDonald as Madame de Garderobe, a world-renowned opera singer and Cadenza's wife who has been transformed into a wardrobe. Gugu Mbatha-Raw as Plumette, one of the castle maids and Lumière's lover who has been transformed into a feather duster. Ian McKellen as Cogsworth, the Beast's gruff but loyal majordomo and the head of the household staff who has been transformed into a mantel clock. Emma Thompson as Mrs. Potts, the castle's motherly head housekeeper who has been transformed into a teapot. Hattie Morahan as Agathe, an impoverished hermit and resident of Villeneuve who, in reality, is the enchantress responsible for cursing the Prince. Morahan also narrates the prologue. Nathan Mack as Chip, Mrs. Potts' plucky son who has been transformed into a teacup. Adrian Schiller as Monsieur D'Arque, the sly warden of the local asylum who is bribed by Gaston to have Maurice institutionalized. ^ In the initial theatrical release, Turner is miscredited as Henry Garrett in the cast. Stephen Merchant also appeared in the film as Monsieur Toilette, a servant who was turned into a toilet. This character was cut from the film, but is featured in the deleted scenes. Previously, Disney had begun work on a film adaptation of the 1994 Broadway musical. However, in a 2011 interview, composer Alan Menken stated the planned film version of the Beauty and the Beast stage musical "was canned". 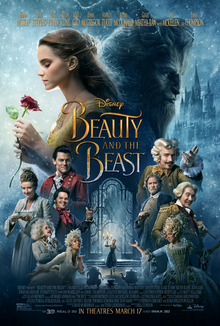 By April 2014, Walt Disney Pictures had already begun developing a new live-action version of Beauty and the Beast after making other live-action fantasy films such as Alice in Wonderland, Maleficent, Cinderella and The Jungle Book. Guillermo del Toro had been previously attached to direct the project; however, he announced in June 2014 that he would drop out. The same month, Bill Condon was eventually signed to direct the film from a script by Evan Spiliotopoulos. Later in September of that same year, Stephen Chbosky (who had previously directed Watson in The Perks of Being a Wallflower) was hired to re-write the script. Before Condon was hired to direct the film, Disney approached him with a proposal to remake the film in a more radical way as Universal Studios had remade Snow White and the Huntsman (2012). Condon later explained that "after Frozen opened, the studio saw that there was this big international audience for an old-school-musical approach. But initially, they said, 'We're interested in a musical to a degree, but only half full of songs.' My interest was taking that film and doing it in this new medium—live-action—as a full-on musical movie. So I backed out for a minute, and they came back and said, 'No, no, no, we get it, let's pursue it that way.'" Walt Disney Pictures president of production Sean Bailey credited Walt Disney Studios chairman Alan F. Horn with the decision to make the film as a musical: "We worked on this for five or six years, and for 18 months to two years, Beauty was a serious dramatic project, and the scripts were written to reflect that. It wasn't a musical at that time. But we just couldn't get it to click and it was Alan Horn who championed the idea of owning the Disney of it all. We realized there was a competitive advantage in the songs. What is wrong with making adults feel like kids again?" In late January 2015, it was announced that Emma Watson had been cast as Belle, the female lead. She was the first choice of Walt Disney Studios chairman Alan F. Horn, as he had previously overseen Warner Bros., which released the eight Harry Potter films that co-starred Watson as Hermione Granger. Two months later, Luke Evans and Dan Stevens were revealed to be in talks to play Gaston and the Beast respectively, and Watson confirmed their casting the following day via Twitter. The rest of the principal cast, including Josh Gad, Emma Thompson, Kevin Kline, Audra McDonald, Ian McKellen, Gugu Mbatha-Raw, Ewan McGregor and Stanley Tucci were announced between March and April to play LeFou, Mrs. Potts, Maurice, Madame de Garderobe, Cogsworth, Plumette, Lumière and Cadenza, respectively. According to The Hollywood Reporter, Watson was reportedly paid $3 million upfront, together with an agreement that her final take-home pay could rise as high as $15 million if the film generated gross box office income similar to Maleficent's $759 million worldwide gross. Principal photography on the film began at Shepperton Studios in Surrey, England, on May 18, 2015. Filming with the principal actors concluded on August 21. Six days later, co-producer Jack Morrissey confirmed that the film had officially wrapped production. The Beast was portrayed with a "more traditional motion capture puppeteering for the body and the physical orientation", where actor Dan Stevens was "in a forty-pound gray suit on stilts for much of the film". The facial capture for the Beast was done separately in order to "communicate the subtleties of the human face" and "[capture the] thought that occurs to him" which gets "through [to] the eyes, which are the last human element in the Beast." The castle servants who are transformed into household objects were created with CGI animation. Before the release of the film, Bill Condon refilmed one certain sequence in the "Days of the Sun" number, due to confusion among test audiences caused by actress Harriet Jones, who looked similar to Hattie Morahan, who portrayed Agathe. In the original version of the scene, it was Jones's character, the Prince's mother, who sings the first verse of the song, with Rudi Goodman playing the young Prince and Henry Garrett playing his father; but in the reshot version of the scene, the singing part is given to the Prince (now played by Adam Mitchell). The King was also recast to Tom Turner, although Harriet Jones was still the Queen, albeit with dark hair. Both Goodman and Garrett's names were mistakenly featured in the original theatrical release's credits, but was later corrected in home releases. When released in 1991, Beauty and the Beast, marked a turning point for Walt Disney Pictures by appealing to millions of fans with its Oscar-winning musical score by lyricist Howard Ashman and composer Alan Menken. In Bill Condon's opinion, that original score was the key reason he agreed to direct a live-action version of the movie. "That score had more to reveal", he says, "You look at the songs and there's not a clunker in the group. In fact, Frank Rich described it as the best Broadway musical of 1991. The animated version was already darker and more modern than the previous Disney fairytales. Take that vision, put it into a new medium, make it a radical reinvention, something not just for the stage because it's not just being literal, now other elements come into play. It's not just having real actors do it". Condon initially prepared on only drawing inspiration from the original film, but he also planned to include most of the songs composed by Alan Menken, Howard Ashman and Tim Rice from the Broadway musical, with the intention of making the film as a "straight-forward, live-action, large-budget movie musical". Menken returned to score the film's music, which features songs from the original film by him and Howard Ashman, plus new material written by Menken and Tim Rice. Menken said the film would not include songs that were written for the Broadway musical and instead, created four new songs. However, an instrumental version of the song "Home", which was written for the musical, is used during the scene where Belle first enters her room in the castle. On January 19, 2017, it was confirmed by both Disney and Céline Dion—singer of the original 1991 "Beauty and the Beast" duet song, with singer Peabo Bryson—that Dion would be performing one of the new original songs "How Does a Moment Last Forever" to play over the end titles. She originally had doubts about whether or not to record the song due to the recent death of her husband and manager René Angélil, who had previously helped her secure the 1991 pop duet. While ultimately accepting the opportunity, she said: "[The] first Beauty and the Beast decision was made with my husband. Now I'm making decisions on my own. It's a little bit harder. I couldn't say yes right away, because I felt like I was kind of cheating in a way". She eventually felt compelled to record the song because of the impact Beauty and the Beast has had on her career. According to Dion, "I was at the beginning of my career, it put me on the map, it put me where I am today". Also, Josh Groban was announced to be performing the new original song "Evermore" on January 26, 2017. The 2017 film features a remake of the 1991 original song recorded as a duet by Ariana Grande and John Legend. Grande and Legend's updated version of the title song is faithful to the original, Grammy-winning duet, performed by Céline Dion and Peabo Bryson for the 1991 Disney film. Disney debuted the music video for Ariana Grande and John Legend's interpretation of the title song on Freeform television network on March 5, 2017, and it has since been viewed over 100 million views on the Vevo video-hosting service. Emma Thompson also performed a rendition of the title song, which was performed by Angela Lansbury in the original 1991 animated film. The world premiere of Beauty and the Beast took place at Spencer House in London on February 23, 2017; and the film later premiered at the El Capitan Theatre in Hollywood, California, on March 2, 2017. The stream was broadcast onto YouTube. A sing along version of the film released in over 1,200 US theaters nationwide on April 7, 2017. The United Kingdom received the same version on April 21, 2017. The film was re-released in New York and Los Angeles for a one-week engagement starting December 1, 2017. The move was an awards push as awards season heats up. Disney spent around $140 million to market the film worldwide. Following an announcement on May 22, 2016, Disney premiered the first official teaser trailer on Good Morning America the next day. In its first 24 hours, the teaser trailer reached 91.8 million views, which was the largest number ever seen for a trailer in that amount of time. This record has since been broken by Thor: Ragnarok, It and Avengers: Infinity War. The first official teaser poster was released on July 7, 2016. On November 2, 2016, Entertainment Weekly debuted the first official image on the cover of their magazine, along with nine new photos. One week later, Emma Watson and Disney debuted a new poster. On November 14, 2016, the first theatrical trailer was released, again on Good Morning America. This reached 127.6 million views in its first 24 hours, setting a new record for the most views in one day, beating Fifty Shades Darker; this record has since been broken by The Fate of the Furious. A TV spot with Watson singing was shown during the 74th Golden Globe Awards. Disney released the final trailer on January 30, 2017. Beauty and the Beast was released on Blu-ray, DVD and Digital HD on June 6, 2017. The film debuted at No. 1 on the NPD VideoScan overall disc sales chart, with all other titles in the top 20, collectively, selling only 40% as many units as Beauty and the Beast. The movie regained the top spot on the national home video sales charts during its third week of release. The movie became available on Netflix on September 19, 2017. Praised for her performance as Belle worldwide, Beauty and the Beast is Emma Watson's highest-grossing film in the domestic side and second-highest-grossing film, behind only the final Harry Potter film, Harry Potter and the Deathly Hallows – Part 2. Beauty and the Beast grossed $504 million in the United States and Canada and $759.5 million in other countries for a worldwide gross of $1.263 billion. With a production budget of $254 million, it is the most expensive musical ever made. In just ten days, it became the highest-grossing live-action musical of all time, beating the nine-year-old record held by Mamma Mia!. It is currently the second-biggest musical ever overall, behind Disney's Frozen (2013). Worldwide, the film proved to be a global phenomenon, earning a total of $357 million over its four-day opening weekend from 56 markets. Critics said the film was playing like superhero movies amongst women. It was the second-biggest March global opening, behind only Batman v Superman: Dawn of Justice, the thirteenth-biggest worldwide opening ever and the seventh-biggest for Disney. This includes $21 million from IMAX plays on 1,026 screens, a new record for an IMAX PG title. It surpassed the entire lifetime total of the original film in just six days. Beauty and the Beast was the 300th digitally remastered release in IMAX company's history, which began with the re-release of Apollo 13 in 2002. Its robust global debut helped push the company past $6 billion for the first time, and led to analysts believing that the film had a shot of passing $1 billion worldwide from theatrical earnings. On April 12, it passed the $1 billion threshold, becoming the first film of 2017, the fourteenth Disney film, and the twenty-ninth film overall to pass the mark. It became the first film since Rogue One (also a Disney property) in December 2016 to make over a billion dollars, and did so on its 29th day of release. It is currently the second-highest-grossing film of 2017 (behind Star Wars: The Last Jedi), the highest-grossing March release, the highest-grossing remake of all time, and the sixth-biggest Disney film. Even after inflation adjusted, it is still ahead of the $425 million gross ($760 million in 2017 dollars) of the original film. Deadline Hollywood calculated the net profit of the film to be $414.7 million, when factoring together all expenses and revenues, making it the second-most profitable release of 2017. In the United States and Canada, Beauty and the Beast topped Fandango's pre-sales and became the fastest-selling family film in the company's history, topping the studio's own animated film Finding Dory released the previous year. Early tracking had the film grossing around $100 million in its opening weekend, with some publications predicting it could reach $130 million. By the time the film's release was 10 days away, analysts raised projections to as high as $150 million. It earned $16.3 million from Thursday previews night, marking the biggest of 2017 (breaking Logan's record), the biggest ever for a Disney live-action film (breaking Maleficent's record), the second-biggest ever for both a G- or PG-rated film (behind the sixth Harry Potter film Harry Potter and the Half-Blood Prince which also starred Watson), and the third-biggest ever in the month of March (behind Batman v Superman: Dawn of Justice and The Hunger Games). An estimated 41% of the gross came from IMAX, 3D and premium large format screenings which began at 6 pm, while the rest—59%—came from regular 2D shows which began at 7 pm. The numbers were considered more impressive given that the film played during a school week. On its opening day, the film made $63.8 million from 4,210 theaters across 9,200 screens, marking the third biggest in the month of March, trailing behind Batman v Superman ($81.5 million) and The Hunger Games ($67 million). It was also the biggest opening day ever for a film that wasn't PG-13, displacing the $58 million opening Wednesday of Harry Potter and the Half-Blood Prince. Its opening day alone (which includes Thursday's previews) almost matched the entire opening weekend of previous Disney live-action films, Maleficent ($69.4 million) and Cinderella ($67.9 million). Unlike all previous four Disney live-action films witnessing a hike on their second day, Saturday, Beauty and the Beast actually fell 2% but, nevertheless, the dip was paltry, and the grosses are so much bigger compared to the other titles. Earning a total of $174.8 million on its opening weekend, it defied all expectations and went on to set numerous notable records. This includes the biggest opening of the year as well as the biggest for the month of March and pre-summer/spring opening, beating Batman v Superman, the biggest start ever for a PG title (also for a family film), surpassing Finding Dory until it was later surpassed by Incredibles 2, the biggest debut of all time for a female-fueled film, ahead of The Hunger Games: Catching Fire, the biggest for a Disney live-action adaptation, ahead of Alice in Wonderland and the biggest musical debut ever, supplanting Pitch Perfect 2. Furthermore, it is also Watson's highest-opening, beating Harry Potter and the Deathly Hallows – Part 2 same with Emma Thompson, director Bill Condon's biggest debut ever ahead of The Twilight Saga: Breaking Dawn – Part 2 and the biggest outside of summer, save for Star Wars: The Force Awakens, not accounting for inflation. It became the forty-third film to debut with over $100 million and the fifteenth film to open above $150 million. Its three-day opening alone surpassed the entire original North American run of the first film ($146 million; before the 3D re-release), instantly becoming the second-biggest film of the year, behind Logan ($184 million), and also the second-highest-grossing musical, behind Grease's $188 million cumulative gross in 1978. Seventy percent of the total ticket sales came from 2D showings signifying that people who don't go to theaters frequently came out in bulk to watch the film. About 26% of the remaining tickets were for 3D. IMAX accounted for 7% ($12.5 million) of the total weekend's gross, setting a new record for a PG title, ahead of Alice in Wonderland ($12.1 million) while PLF repped 11% of the box office. Seventy percent of the film's opening day demographic was female, dropping to 60% through the weekend. According polling service PostTrak, about 84 percent of American parents who saw the film on its opening day said they would "definitely" recommend it for families. The film's opening was credited to positive word of mouth from audiences, good reviews from critics, effective marketing which sold the title not just as a family film but also as a romantic drama, the cast's star power (especially Emma Watson), lack of competition, being the first family film since The Lego Batman Movie a month earlier, nostalgia, and the success and ubiquity of the first film and Disney's brand. On Monday, its fourth day of release, the film fell precipitously by 72% earning $13.5 million. The steep fall was due to a limited marketplace where only 11% K-12 and 15% colleges were off per ComScore. Nevertheless, it is the second-biggest March Monday, behind Batman v Superman ($15 million). This was followed by the biggest March and pre-summer Tuesday with $17.8 million, a 32% increase from its previous day. The same day, the film passed $200 million in ticket sales. It earned $228.6 million in the first week of release, the sixth-biggest seven-day gross of all time. In its second weekend, the film continued to maintain the top positioning and fell gradually by 48% earning another $90.4 million to register the fourth-biggest second weekend of all time, and the third-biggest for Disney. In terms of percentage drop, its 48% decline is the third-smallest drop for any film opening above $125 million (behind Finding Dory and The Force Awakens). The hold was notable considering how the film was able to fend off three new wide releases: Power Rangers, Life, and CHiPs. As a result, it passed the $300 million threshold becoming the first film of 2017 the pass said mark. The film grossed $45.4 million in its third weekend, finally being overtaken for the top spot by newcomer The Boss Baby ($50.2 million). On April 4, 2017, its nineteenth day of release, it passed the $400 million threshold becoming the first film of 2017 to do so. By its fourth weekend, the film began was playing in 3,969 cinemas, a fall of 241 theaters from its previous weekend. Of those, approximately 1,200 cinemas were sing-along versions. It earned $26.3 million (−48%) and retained second place. By comparison, previous Disney films Moana (−8%) and Frozen (−2%) both witnessed mild percentage declines the weekend their sing-alone versions were released. Its seventh weekend of release was in contemporaneous with another Emma Watson-starring new film The Circle. That weekend, The Circle was number four, while Beauty and the Beast was at number six. By May 28, the film had earned over $500 million in ticket sales becoming the first film of 2017 (until it was later surpassed by The Last Jedi), the third female-fueled film (after The Force Awakens and Rogue One: A Star Wars Story followed by Wonder Woman and The Last Jedi) and the eighth overall film in cinematic history to pass the mark. It has already become the biggest March release, dethroning The Hunger Games (2012), the biggest musical film (both animated and live-action), as well as the biggest film of 2017 (alongside The Last Jedi). Outside the US and Canada, the film began playing on Thursday, March 16, 2017. Through Sunday, March 19, it had a total international opening of $182.3 million from 55 markets, 44 of which were major territories, far exceeding initial estimations of $100 million and opened at No. 1 in virtually all markets except Vietnam, Turkey, and India. Its launch is the second-biggest for the month of March, behind Batman v Superman ($256.5 million). In IMAX, it recorded the biggest debut for a PG-rated title (although it carried varying certificate amongst different markets) with $8.5 million from 649 screens, the second-biggest for a PG title behind The Jungle Book. In its second weekend, it fell just by 35% earning another $120.6 million and maintaining its first position hold. It added major markets like France and Australia. It topped the international box office for three consecutive weekends before finally being dethroned by Ghost in the Shell and The Boss Baby in its fourth weekend. Despite the fall, the film helped Disney push past the $1 billion thresold internationally for the first time in 2017. It scored the biggest opening day of the year in Hong Kong and the Philippines, the biggest March Thursday in Italy ($1 million, also the biggest Disney Thursday debut), the biggest March opening day in Austria, and the second-biggest in Germany ($1.1 million), Disney's biggest March in Denmark, the biggest Disney live-action debut in China ($12.6 million), the UK ($6.2 million), Mexico ($2.4 million) and Brazil ($1.8 million) and the third-biggest in South Korea with $1.2 million, behind only Pirates of the Caribbean: At World's End and Pirates of the Caribbean: On Stranger Tides. In terms of opening weekend, the largest debut came from China ($44.8 million), followed by the UK ($24.3 million), Korea ($11.8 million), Mexico ($11.8 million), Australia ($11.1 million), Brazil ($11 million), Germany ($10.7 million), France ($8.4 million), Italy ($7.6 million), Philippines ($6.3 million), Russia ($6 million), and Spain ($5.8 million). In the United Kingdom and Ireland, the film recorded the biggest opening ever for a PG-rated film, the biggest Disney live-action opening of all time, the biggest March opening weekend, the biggest opening for a musical (ahead of 2012's Les Misérables), the number one opening of 2017 to date and the fifth-biggest-ever overall with £19.7 million ($24.5 million) from 639 theatres and almost twice that of The Jungle Book (£9.9 million). This included the second-biggest Saturday ever (£7.9 million), only behind Star Wars: The Force Awakens. It witnessed a decline in its second weekend, earning £12.33 million ($15.4 million). Though the film was falling at a faster rate than The Jungle Book, it had already surpassed the said film and its second weekend is the third-biggest ever (behind the two James Bond films Skyfall (2012) and Spectre). In India, despite facing heavy competitions from four new Hindi releases, two Tamils films and a Malayalam and a Punjabi release, the film managed to take an occupancy of 15% on its opening day, an impressive feat despite tremendous competitions. It earned around ₹15 million (US$210,000) nett on its opening day from an estimated 600 screens which is more than the three Hindi releases—Machine, Trapped, and Aa Gaya Hero—combined. Disney reported a total of ₹92.6 million (US$1.3 million) gross for its opening weekend there. It was ahead of all new releases and second overall behind Bollywood film Badrinath Ki Dulhania. In Russia, despite receiving a restrictive 16 rating, the film managed to deliver a very successful opening with $6 million. In China, expectations were high for the film. The release date was announced on January 24, giving Disney and local distributor China Film Group Corporation ample time—around two months—to market the film nationwide. The release date was strategically chosen to coincide with White Day. Preliminary reports suggested that it could open to $40–60 million in its opening weekend. Largely driven by young women, its opening day pre-sales outpaced that of The Jungle Book. The original film was, however, never widely popular in the country. Although China has occasionally blocked gay-themed content from streaming video services, in this case, Chinese censors decided to leave the gay scene intact. According to local box office tracker Ent Group, the film grossed an estimated $12.1 million on its opening day (Friday), representing 70% of the total receipts. Including previews, it made a total of $14.5 million from 100,000 screenings, which is 43% of all screenings in the country. It climbed to $18.5 million on Saturday (102,700 showings) for a three-day total of $42.6 million, securing 60% of the total marketplace. Disney on the other hand reported a different figure of $44.8 million. Either ways, it recorded the second-biggest opening for a Disney live-action film, with $3.4 million coming from 386 IMAX screens. Japan—a huge Disney market—served as the film's final market and opened there on April 21. It debuted with a better-than-expected $12.5 million on its opening weekend helping the film push past the $1.1 billion threshold. An estimated $1.1 million came from IMAX screenings, the fourth-biggest ever in the country. The two-day gross was $9.7 million, outstripping Frozen's previous record of $9.5 million. Due to positive reviews, good word-of-mouth and benefitting from the Golden Week, the film saw a 9% increase on its second weekend. The hold was strong enough to fend off newcomer The Fate of the Furious from securing the top spot. The total there is now over $98 million after seven weekends and is the biggest film release of the year and, overall, the eleventh-biggest of all time. It topped the box office there for eight consecutive weekends. The only markets where the film did not top the weekend charts were Vietnam (behind Kong: Skull Island), Turkey (with two local movies and Logan ahead) and India (where Badrinath Ki Dulhania retained No. 1). It topped the box office for four straight weekends in Germany, Korea, Austria, Finland, Poland, Portugal, Brazil, Venezuela, Bolivia, Switzerland and the UK (exclusive of previews). In the Philippines, it emerged as the most successful commercial film of all time—both local and foreign—with over $13.5 million. In just five weeks, the film became one of the top 10 highest-grossing film of all time in the United Kingdom and Ireland, ahead of all but one Harry Potter film (Deathly Hallows – Part 2) and all three The Lord of the Rings movies (which also starred Ian McKellen). It is currently the eighth-biggest grosser with £70.1 million ($90 million), overtaking Mamma Mia! to become the biggest musical production ever there. The biggest international earning markets following the UK are Japan ($108 million), China ($85.8 million), Brazil ($41.5 million), Korea ($37.5 million), and Australia ($35 million). In Europe alone, the cumulative total is $267 million, which led it to become the second-highest-grossing film in the past year (behind Rogue One: A Star Wars Story). Beauty and the Beast received generally positive reviews, with praise for its ensemble cast, visuals, production values, musical score, songs, and faithfulness to the original film with a few elements of the Broadway musical version, while the designs of the Beast and the servants' household object forms received mixed reviews. On review aggregator Rotten Tomatoes, the film has an approval rating of 71% based on 346 reviews, with an average rating of 6.7/10. The website's critical consensus reads, "With an enchanting cast, beautifully crafted songs, and a painterly eye for detail, Beauty and the Beast offers a faithful yet fresh retelling that honors its beloved source material." On Metacritic, the film has a score of 65 out of 100, based on 47 critics, indicating "generally favorable reviews". In CinemaScore polls, audiences gave the film an average grade of "A" on an A+ to F scale. Leslie Felperin of The Hollywood Reporter wrote: "It's a Michelin-triple-starred master class in patisserie skills that transforms the cinematic equivalent of a sugar rush into a kind of crystal-meth-like narcotic high that lasts about two hours." Felperin also praised the performances of Watson and Kline as well the special effects, costume designs and the sets, while commending the inclusion of Gad's character of LeFou as the first LGBT character in Disney. Owen Gleiberman of Variety, in his positive review of the film, wrote: "It's a lovingly crafted movie, and in many ways a good one, but before that it's an enraptured piece of old-is-new nostalgia." Gleiberman compared Steven's character of the Beast to a royal version of the titular character in The Elephant Man and the 1946 version of the Beast in Jean Cocteau's original adaptation. A. O. Scott of The New York Times praised the performances of both Watson and Stevens, and wrote: "It looks good, moves gracefully and leaves a clean and invigorating aftertaste. I almost didn't recognize the flavor: I think the name for it is joy." Likewise, The Washington Post's Ann Hornaday complimented Watson's performance, describing it as "alert and solemn" while noting her singing ability as "serviceable enough to get the job done". Richard Roeper of Chicago Sun-Times awarded the film three and a half stars, lauded the performances of Watson and Thompson which he drew a comparison to Paige O'Hara's and Angela Lansbury's performances in the 1991 animated version while appreciating the performances of the other cast and also pointing out on its usage of the combination of motion capture and CGI technology as a big advantage which he stated: "Almost overwhelmingly lavish, beautifully staged and performed with exquisite timing and grace by the outstanding cast". Mike Ryan of Uproxx praised the cast, production design and the new songs while noting the film doesn't try anything different, saying: "There's certainly nothing that new about this version of Beauty and the Beast (well, except it isn't a cartoon anymore), but it's a good recreation of a classic animated film that should leave most die-hards satisfied." In her A- review, Nancy Churnin of The Dallas Morning News praised the film's emotional and thematic depth, remarking: "There's an emotional authenticity in director Bill Condon's live-action Beauty and the Beast film that helps you rediscover Disney's beloved 1991 animated film and 1994 stage show in fresh, stirring ways." James Berardinelli of ReelViews described the 2017 version as "enthralling". Brian Truitt of USA Today commended the performances of Evans, Gad, McGregor and Thompson alongside Condon's affinity with musicals, the production design, visual effects featured in some of the song numbers including new songs made by the composers Alan Menken and Tim Rice, particularly Evermore which he described the new song with a potential for an Academy Award for Best Original Song. Peter Travers of Rolling Stone rated the film three out of four stars which he deemed it as an "exhilarating gift" while he remarked that "Beauty and the Beast does justice to Disney's animated classic, even if some of the magic is M.I.A (Missing in Action)". Stephanie Zacharek of Time magazine gave a positive review with a description as "Wild, Vivid and Crazy-Beautiful" as she wrote "Nearly everything about Beauty and the Beast is larger than life, to the point that watching it can be a little overwhelming." and added that "it's loaded with feeling, almost like a brash interpretive dance expressing the passion and elation little girls (and some boys, too) must have felt upon seeing the earlier version." The San Francisco Chronicle's Mick LaSalle struck an affirmative tone, calling it one of the joys of 2017, stating that "Beauty and the Beast creates an air of enchantment from its first moments, one that lingers and builds and takes on qualities of warmth and generosity as it goes along" while referring the film as "beautiful" and also praised the film for its emotional and psychological tone as well Steven's motion capture performance. Tim Robey of The Daily Telegraph gave the film four stars out of five and wrote that "It dazzles on this chocolate box of a picture that feels almost greedy yet to make this film work, down to a sugar-rush finale to grasp the nettle and make an out-an-out, bells-and-whistles musical" while he praised the performances of Watson, McKellen, Thompson, McGregor, Evans and Gad. Mark Hughes of Forbes also similarly praised the film which he wrote that "it could revive the story in a faithful but entirely new and unique way elevating the material beyond expectations, establishing itself as a cinematic equal to the original" and also complimented the importance of undertaking a renowned yet problematic masterpiece as well addressing changes in the elements of the story while acknowledging the film's effectiveness in resonating to the audiences. Stephen Whitty of the New York Daily News called it "this year's best new old musical" and "the most magical thing of all" while describing Watson's performance of Belle as "breakthrough". Several critics regarded the film as inferior to its 1991 animated predecessor. David Sims of The Atlantic wrote that the 2017 film "feels particularly egregious, in part, because it's so slavishly devoted to the original; every time it falls short of its predecessor (which is quite often), it's hard not to notice". Michael Phillips of the Chicago Tribune said that the 2017 film "takes our knowledge and our interest in the material for granted. It zips from one number to another, throwing a ton of frenetically edited eye candy at the screen, charmlessly." Phillips wrote that the film featured some "less conspicuously talented" performers who are "stuck doing karaoke, or motion-capture work of middling quality", though he praised Kline's performance as the "best, sweetest thing in the movie; he brings a sense of calm, droll authority". Peter Bradshaw of The Guardian praised Watson's performance and wrote that the film was "lit in that fascinatingly artificial honey-glow light, and it runs smoothly on rails—the kind of rails that bring in and out the stage sets for the lucrative Broadway touring version." In the same newspaper, Wendy Ide criticized the film as "ornate to the point of desperation" in its attempt to emulate the animated film. Chris Nashawaty of Entertainment Weekly gave the film a B-, writing that the new songs were "not transporting". He felt the film needed more life and depth, but praised Watson's performance as the "one of the film's stronger elements". Dana Schwartz of The New York Observer felt that some of the characters, such as Gaston and the Beast, had been watered down from the 1991 film, and that the additional backstory elements failed to "advance the plot or theme in any meaningful way" while adding considerable bloat. Schwartz considered the singing of the cast to be adequate but felt that their voices should have been dubbed over, especially for the complex songs. Controversy erupted after director Bill Condon said there was a "gay moment" in the film, when LeFou briefly waltzes with Stanley, one of Gaston's friends. Afterwards in an interview with Vulture.com, Condon stated, "Can I just say, I'm sort of sick of this. Because you've seen the movie—it's such a tiny thing, and it's been overblown." Condon also added that Beauty and the Beast features much more diversity than just the highly talked-about LeFou: "That was so important. We have interracial couples—this is a celebration of everybody's individuality, and that's what's exciting about it." GLAAD president and CEO Sarah Kate Ellis praised the move stating, "It is a small moment in the film, but it is a huge leap forward for the film industry." In Russia, Vitaly Milonov agitated the culture minister for banning the film, but instead it was given a 16+ rating (children under the age of 16 can only be admitted to see it in theaters with accompanying adults). Additionally, a theater in Henagar, Alabama did not screen the film because of the subplot. In Malaysia, the Film Censorship Board insisted the "gay moment" scene be cut, prompting an indefinite postponement of its release by Disney, followed by their decision to withdraw it completely if it could not be released uncensored. The studio moved the release date to March 30, to allow more time for Malaysia's censor board to make a decision on whether or not to release the film without changes. The distributors and producers then submitted an appeal to the Film Appeal Committee of Malaysia, which allowed the film to be released without any cuts and a P13 rating on the grounds that "the gay element was minor and did not affect the positive elements featured in the film". In Kuwait, the movie was withdrawn from cinemas by National Cinema Company which owns most of the cinemas in the country. A board member of the company stated that the Ministry of Information's censorship department had requested it to stop its screening and edit it for things deemed offensive by it. The film also received criticism over its portrayal of LeFou, as many felt that it relied on stereotypes and was used as a way of teasing LGBT+ viewers without providing adequate representation. LeFou's status as a sidekick to the main villain brought about criticism over Disney's queercoding of villains in the past, and his infatuation with Gaston was seen as relying on a stereotype of gay men being predatory towards straight men. Furthermore, the only gay interaction LeFou has is a three-second clip of him dancing with another man at the end of the film. Many saw this as Disney cheating its LGBT+ audiences. Disney has sought to portray Belle as an empowered young woman, but a debate questioning whether it is possible for a captor to fall in love with their prisoner, and whether this is a problematic theme, has resulted. As was the case with the original animated film, one argument is that Belle suffers from Stockholm syndrome (a condition that causes hostages to develop a psychological alliance with their captors as a survival strategy during captivity). Emma Watson studied whether Belle is trapped in an abusive relationship with the Beast before signing on and concluded that she does not think the criticism fits this version of the folk tale. [not in citation given] Watson described Stockholm Syndrome as "where a prisoner will take on the characteristics of and fall in love with the captor. Belle actively argues and disagrees with [Beast] constantly. She has none of the characteristics of someone with Stockholm Syndrome because she keeps her independence, she keeps that freedom of thought", also adding that Belle defiantly "gives as good as she gets" before forming a friendship and romance with the Beast. Psychiatrist Frank Ochberg, who was responsible for defining the term "Stockholm syndrome", said he does not think Belle exhibits the trauma symptoms of prisoners suffering from the syndrome because she does not go through a period of feeling that she is going to die. Some therapists, while acknowledging that the pairing's relationship does not meet the clinical definition of Stockholm syndrome, argue that the relationship depicted is dysfunctional and abusive and does not model healthy romantic relationships for young viewers. Constance Grady of Vox writes that Jeanne-Marie Leprince de Beaumont's Beauty and the Beast was a fairy tale originally written to prepare young girls in 18th-century France for arranged marriages, and that the power disparity is amplified in the Disney version. Anna Menta of Elite Daily argued that the Beast does not apologize to Belle for imprisoning, hurting, or manipulating her, and his treatment of Belle is not painted as wrong. ^ Also credited for Darkest Hour. ^ Tied with Mark Bridges for Phantom Thread. ^ a b "Beauty and the Beast Press Kit" (PDF). wdsmediafile.com. Walt Disney Studios. Retrieved April 7, 2017. ^ "Beauty and the Beast remake: A traditional tale with a modern twist". University of New York. March 13, 2017. Archived from the original on April 14, 2017. Retrieved April 14, 2017. ^ "BEAUTY AND THE BEAST (PG)". British Board of Film Classification. February 16, 2017. Archived from the original on March 3, 2017. Retrieved March 7, 2017. ^ a b c "Beauty and the Beast (2017)". Box Office Mojo. Retrieved August 14, 2017. ^ "2017 Feature Film Study" (PDF). FilmL.A. August 8, 2018: 23. Retrieved August 11, 2018. ^ a b Christian Sylt (June 8, 2018). "The $255 Million Spell That Disney Cast On Britain". Forbes. Retrieved June 13, 2018. ^ McClintock, Pamela (May 24, 2016). "'Beauty and the Beast' Teaser Tops 'Star Wars: Force Awakens' in First Day". The Hollywood Reporter. Archived from the original on April 4, 2017. Retrieved May 25, 2016. ^ a b Erbland, Kate. "'Beauty and the Beast' Is a Technological Marvel, But for Its Actors, the Challenge was Daunting". IndieWire. Penske Business Media. Archived from the original on March 24, 2017. Retrieved March 23, 2017. ^ Fletcher, Rosie (December 1, 2016). "Beauty and the Beast 2017 cast, trailer, release date and everything you need to know". Digital Spy. Archived from the original on March 4, 2017. Retrieved January 26, 2017. ^ Phillips, Ian; Acuna, Kristin (October 27, 2015). "Disney announced all its movies coming in the next 4 years—here's what you have to look forward to". Tech Insider. Archived from the original on January 5, 2016. Retrieved November 3, 2015. ^ a b "Live-action 'Beauty and the Beast' is still enchanting (but the original is better)". The Charlotte Observer. Robert W. Butler. March 16, 2017. Archived from the original on September 10, 2017. ^ a b Chris Hunneysett (March 17, 2017). "Beauty and the Beast review: Irresistible charm shows no one casts a spell quite like Disney". Daily Mirror. Archived from the original on September 10, 2017. Retrieved April 27, 2017. ^ a b Emma Watson [@EmWatson] (March 5, 2015). "Could not be more happy that this man will be Beast!!! Welcome aboard @thatdanstevens #beautyandthebeast pic.twitter.com/F1ghG3pvcU" (Tweet). Retrieved March 9, 2015 – via Twitter. ^ Earnest, Karen. "Dan Stevens to Star in 'The Man Who Invented Christmas'". Movies.mxdwn.com. Archived from the original on November 15, 2016. Retrieved March 2, 2017. ^ a b c d e Ford, Rebecca (March 16, 2015). "Disney's Live-Action 'Beauty and the Beast' Gets Release Date". The Hollywood Reporter. Archived from the original on January 7, 2017. Retrieved March 16, 2015. ^ a b Kit, Borys (March 13, 2015). "Josh Gad Joining Disney's Live-Action 'Beauty and the Beast' (Exclusive)". The Hollywood Reporter. Archived from the original on March 15, 2015. Retrieved March 15, 2015. ^ a b Kit, Borys (April 21, 2015). "Ewan McGregor to Play Lumiere in 'Beauty and the Beast' (Exclusive)". The Hollywood Reporter. Archived from the original on April 21, 2015. Retrieved May 19, 2015. ^ a b Kroll, Justin (April 21, 2015). "Stanley Tucci Rounds Out Cast of 'Beauty and the Beast' (EXCLUSIVE)". Variety. Archived from the original on May 17, 2015. Retrieved May 19, 2015. ^ a b Kit, Borys (March 27, 2015). "Audra McDonald Joining Disney's Live-Action 'Beauty and the Beast' (Exclusive)". The Hollywood Reporter. Archived from the original on May 20, 2015. Retrieved April 16, 2015. ^ a b Kroll, Justin (April 13, 2015). "'Beyond the Lights' Star Gugu Mbatha-Raw Joins 'Beauty and the Beast' (EXCLUSIVE)". Variety. Archived from the original on April 14, 2015. Retrieved April 14, 2015. ^ a b Kroll, Justin (April 10, 2015). "Ian McKellen to Play Cogsworth in Disney's 'Beauty and the Beast' (EXCLUSIVE)". Variety. Archived from the original on April 11, 2015. Retrieved April 11, 2015. ^ a b "Beauty and the Beast Release Date – 2017". Releasedateportal.com. June 30, 2016. Archived from the original on February 26, 2017. Retrieved March 2, 2017. ^ Gavin, Michael (August 27, 2016). "PHOTO: First look at Dan Stevens Beast (prince form) from Disney's live-action 'Beauty and the Beast' movie!". Inside the Magic. Archived from the original on December 26, 2016. Retrieved March 2, 2017. ^ a b "Bill Condon Reveals 'Beauty and the Beast' Mistake in Alternate 'Days in the Sun' Sequence". Retrieved September 2, 2017. ^ Marmiroli, Adriana (June 5, 2009). "Alan Menken Adesso musicalanche in Italia" [Alan Menken musicals now in Itaty]. La Stampa (in Italian). Archived from the original on May 24, 2015. Retrieved May 21, 2015. ^ Hill, Jim (July 1, 2009). "Hollywood bets big on 'Beast,' considers remake of 'My Fair Lady'". Jim Hill Media. Archived from the original on July 4, 2009. Retrieved May 21, 2015. ^ Brew, Simon (January 11, 2011). "Alan Menken interview: Tangled, movie scores, musicals, Enchanted 2, Snow Queen and more". Den of Geek. Archived from the original on January 21, 2013. Retrieved January 22, 2011. ^ Chitwood, Adam (April 11, 2014). "Rumor: Could Bill Condon Direct Disney's Live-Action BEAUTY AND THE BEAST?". Collider. Archived from the original on May 24, 2015. Retrieved May 20, 2015. ^ Chitwood, Adam (June 12, 2014). "Guillermo del Toro Drops Out of BEAUTY AND THE BEAST with Emma Watson". Collider. Retrieved February 16, 2019. ^ Kroll, Justin (June 4, 2014). "Bill Condon to Direct Live-Action 'Beauty and the Beast' Film for Disney". Variety. Archived from the original on February 6, 2015. Retrieved January 27, 2015. ^ Sperling, Nicole (September 29, 2014). "'Perks of Being a Wallflower' author will adapt 'Beauty and the Beast'". Entertainment Weekly. Archived from the original on October 1, 2014. Retrieved September 30, 2014. ^ Kilday, Gregg (March 2, 2017). "'Beauty and the Beast' Director on How 'La La Land' Is Bringing Musicals Back". The Hollywood Reporter. Prometheus Global Media. Archived from the original on March 3, 2017. Retrieved April 3, 2017. ^ a b Fleming, Jr., Mike (March 21, 2017). "Sean Bailey on How Disney's Live-Action Division Found Its 'Beauty and the Beast' Mojo". Deadline Hollywood. Los Angeles: Penske Business Media. Archived from the original on September 10, 2017. Retrieved April 3, 2017. ^ Hayden, Erik (January 26, 2015). "Emma Watson Cast in Disney's Live-Action 'Beauty and the Beast'". The Hollywood Reporter. Archived from the original on January 3, 2017. Retrieved January 27, 2015. ^ Kroll, Justin (March 4, 2015). "Luke Evans to Play Gaston in Disney's 'Beauty and the Beast' (EXCLUSIVE)". Variety. Archived from the original on March 6, 2015. Retrieved March 9, 2015. ^ Kit, Borys (March 4, 2015). "Disney's 'Beauty and the Beast' Casting Dan Stevens as the Beast (Exclusive)". The Hollywood Reporter. Archived from the original on March 5, 2015. Retrieved March 9, 2015. ^ Emma Watson [@EmWatson] (March 5, 2015). "Bonjour Gaston! ❤️ Welcome! #BeautyAndTheBeast pic.twitter.com/oerhe1ilGs" (Tweet). Retrieved March 9, 2015 – via Twitter. ^ Thomlison, Adam. "Q & A". TV Media. Archived from the original on October 3, 2015. Retrieved August 3, 2015. ^ "Original Broadway 'Belle' Susan Egan Comments on Emma Watson in BEAUTY AND THE BEAST". Broadway World. January 26, 2015. Archived from the original on September 10, 2017. Retrieved August 11, 2015. ^ "Paige O'Hara wants to teach Emma Watson". Emma Watson Updates. February 4, 2015. Archived from the original on March 4, 2016. Retrieved August 11, 2015. ^ Tatiana Siegel (March 17, 2017). "Emma Watson and What Disney Pays Its Modern Princesses". The Hollywood Reporter. Archived from the original on April 26, 2017. Retrieved March 17, 2017. ^ Foutch, Haleigh (March 7, 2015). "Todd Lieberman Offers Updates on Allegiant and Disney's Beauty and the Beast". Collider. Archived from the original on September 10, 2017. Retrieved May 19, 2015. ^ "On the Set for 5/18/15: Emma Watson Starts 'Beauty and the Beast', Oliver Stone Wraps 'Snowden', Melissa Mccarthy Finishes 'Michelle Darnell' & More". SSN Insider. May 18, 2015. Archived from the original on May 20, 2015. Retrieved May 18, 2015. ^ Trumbore, Dave (August 23, 2015). "Emma Watson Wraps 'Beauty and the Beast' on 'Harry Potter' Anniversary". Collider. Archived from the original on October 6, 2015. Retrieved August 23, 2015. ^ "Twitter Watch: Emma Watson & Luke Evans Wrap Filming on BEAUTY AND THE BEAST". Broadway World. August 24, 2015. Archived from the original on September 10, 2017. Retrieved August 27, 2015. ^ "Disney's Live Action BEAUTY AND THE BEAST Officially Wraps Production!". Broadway World. August 27, 2015. Archived from the original on September 10, 2017. Retrieved August 27, 2015. ^ "Tale as Old as Time: Bill Condon livens up Disney's 'Beauty and the Beast' | Film Journal International". Filmjournal.com. Archived from the original on September 10, 2017. Retrieved March 8, 2017. ^ Tapley, Kristopher (June 4, 2014). "'Twilight' director Bill Condon will translate Disney's 'Beauty and the Beast' to live action (UPDATED)". HitFix. Archived from the original on June 5, 2014. Retrieved June 5, 2014. ^ McNary, Dave (March 16, 2015). "Disney's Live-Action 'Beauty and the Beast' Set for March 17, 2017". Variety. Archived from the original on May 17, 2015. Retrieved May 28, 2015. ^ Robbins, Caryn (June 5, 2015). "Alan Menken Confirms 3 New Songs for BEAUTY AND THE BEAST Film; Broadway Tunes Will Not Be Included". Broadway World. Archived from the original on September 10, 2017. Retrieved June 5, 2015. ^ Lee, Ashley (March 14, 2017). "'Beauty and the Beast' Composer Alan Menken on Rediscovering Lost Lyrics and Why He's "Shutting Up" About That Gay Character". The Hollywood Reporter. Archived from the original on September 10, 2017. Retrieved March 15, 2017. ^ Tracy, Brianne (January 19, 2017). "Céline Dion Set to Perform New Song for Live-Action Beauty and the Beast Soundtrack". Music. People. Archived from the original on September 10, 2017. Retrieved January 26, 2017. ^ Dion, Céline (January 19, 2017). "I am thrilled to announce that I'll be performing an all-new original song, "How Does A Moment Last Forever," for Disney's live-action Beauty and the Beast. Being a part of the original film was such a magical experience in my life, and I'm truly honored to be a part of this film again. // Je suis ravie de vous annoncer que je chanterai la nouvelle chanson thème du film La Belle et la Bête, "How Does A Moment Last Forever". Avoir fait partie du film original de Disney a été une expérience magique dans ma vie et je suis encore plus honorée de répéter cette expérience. – Céline". Instagram. Archived from the original on March 16, 2017. Retrieved January 20, 2017. ^ Tracey, Brianne (January 19, 2017). "Céline Dion Set to Perform New Song for Live-Action Beauty and the Beast Soundtrack". People. Archived from the original on September 10, 2017. Retrieved January 20, 2017. ^ "Céline Dion To Perform Original Song "How Does A Moment Last Forever" For Disney's "Beauty and the Beast"". January 19, 2017. Archived from the original on February 2, 2017. Retrieved January 19, 2017. ^ Gettell, Oliver (January 26, 2017). "Beauty and the Beast: Josh Groban records new song Evermore". Ew.com. Archived from the original on February 25, 2017. Retrieved March 2, 2017. ^ Grande, Ariana (January 10, 2017). "Ariana Grande on Instagram: "🥀."". Instagram. Archived from the original on January 4, 2018. Retrieved January 11, 2017. ^ Nessif, Bruna (January 10, 2017). "It Looks Like Ariana Grande and John Legend Are Teaming Up for a Beauty and the Beast Duet". E!. Archived from the original on January 13, 2017. Retrieved January 11, 2017. ^ Reed, Ryan. "Watch Ariana Grande, John Legend Cover 'Beauty and the Beast' Theme". Rolling Stone. Archived from the original on September 10, 2017. Retrieved March 8, 2017. ^ a b Maane Khatchatourian. "Beauty and the Beast Music Video: Ariana Grande John Legend Sing Theme". Variety. Archived from the original on March 7, 2017. Retrieved March 8, 2017. ^ Couch, Aaron; Kit, Borys (August 16, 2015). "Disney Shows off 'Pirates 5,' 'Beauty and the Beast' at D23". The Hollywood Reporter. Archived from the original on September 17, 2015. Retrieved August 15, 2015. ^ Williams, Helena (February 23, 2017). ""Beauty and the Beast" premieres in London". Daily Mail. Archived from the original on February 26, 2017. Retrieved February 25, 2017. ^ JeniLynn Knopp (April 3, 2017). ""Beauty and the Beast Sing Along" to hit theaters this Friday". Inside the Magic. Archived from the original on September 10, 2017. Retrieved April 30, 2017. ^ "Beauty and the Beast Sing-A-Long | Book tickets at Cineworld Cinemas". www.cineworld.co.uk. Retrieved January 19, 2018. ^ Collis, Clark (November 27, 2017). "Beauty and Beast returns to theaters". Entertainment Weekly. Retrieved December 3, 2017. ^ Brooks Barnes (March 8, 2017). "'Beauty and the Beast': Disney's $300 Million Gamble". The New York Times. Archived from the original on March 9, 2017. Retrieved March 8, 2017. ^ Gallagher, Simon. "Disney's Live Action Beauty & The Beast Trailer Debuts Tomorrow". WhatCulture.com. Archived from the original on June 10, 2016. Retrieved May 22, 2016. ^ Collis, Clark. "Beauty and the Beast trailer: Disney's live-action remake debuts first teaser". Entertainment Weekly. Archived from the original on June 27, 2016. Retrieved May 23, 2016. ^ Gettell, Oliver. "Beauty and the Beast teaser outpaces Star Wars, Marvel in first day". Entertainment Weekly. Archived from the original on June 27, 2016. Retrieved May 25, 2016. ^ Spangler, Todd (December 19, 2017). "'Avengers: Infinity War' Tops List of 2018 Most-Anticipated Movies, IMDb Data Reveals". Variety. Retrieved January 19, 2018. ^ Drum, Nicole (December 19, 2017). "'Avengers: Infinity War' Is Most Anticipated Movie According to IMDb". Comicbook. Retrieved January 19, 2018. ^ Collis, Clark. "Beauty and the Beast debuts new teaser poster with flower power". Entertainment Weekly. Archived from the original on September 8, 2016. Retrieved July 7, 2016. ^ Collis, Clark. "This Week's Cover: Be our guest for an exclusive look at Disney's live-action Beauty and the Beast". Entertainment Weekly. Archived from the original on November 13, 2016. Retrieved November 2, 2016. ^ EW Staff. "'Beauty and the Beast': See 9 Enchanting, Exclusive Photos". Entertainment Weekly. Archived from the original on November 3, 2016. Retrieved November 2, 2016. ^ Danielle Jackson. "Emma Watson shares stunning new teaser poster for Beauty and the Beast". Entertainment Weekly. Archived from the original on November 13, 2016. Retrieved November 11, 2016. ^ Jessica Derschowitz. "Beauty and the Beast debuts magical new trailer". Entertainment Weekly. Archived from the original on November 14, 2016. Retrieved November 14, 2016. ^ Clark Collis. "Beauty and the Beast trailer beats Fifty Shades, Star Wars for new record". Entertainment Weekly. Archived from the original on November 15, 2016. Retrieved November 15, 2016. ^ Kofi Outlaw. "Fate of the Furious Trailer Breaks Record for Most Views in 24 Hours". ComicBook.com. Archived from the original on September 10, 2017. Retrieved January 8, 2017. ^ Scott Mendelson. "Watch Emma Watson Sing 'Belle' In Disney's 'Beauty and the Beast' TV Spot". Forbes.com. Archived from the original on September 10, 2017. Retrieved January 30, 2017. ^ Clark Collis. "Beauty and the Beast: Watch the final trailer". Entertainment Weekly. Archived from the original on September 10, 2017. Retrieved January 31, 2017. ^ Pratt, Thom (May 12, 2017). "Disney's 'Beauty and the Beast' Comes to Blu-ray, Digital HD and DVD on June 6". The Kingdom Insider. Archived from the original on September 10, 2017. Retrieved May 13, 2017. ^ Arnold, Thomas K. (June 14, 2017). "'Beauty and the Beast' Debuts Atop Disc Charts". Variety. Archived from the original on June 15, 2017. Retrieved June 15, 2017. ^ Arnold, Thomas K. (June 28, 2017). "'Beauty and the Beast' Regains Top Spot on Disc Charts". Variety. Archived from the original on June 29, 2017. Retrieved June 29, 2017. ^ "Emma Watson". Box Office Mojo. Archived from the original on April 13, 2017. Retrieved April 13, 2017. ^ Anne Thompson (March 14, 2017). "'Beauty and the Beast': How Bill Condon Built Hollywood's Most Expensive Musical". IndieWire. Archived from the original on August 1, 2017. Retrieved March 15, 2017. ^ a b Scott Mendelson (March 28, 2017). "Box Office: 'Beauty And The Beast' Waltzes Past $700M Worldwide". Forbes. Archived from the original on September 10, 2017. Retrieved March 28, 2017. ^ "WORLDWIDE OPENINGS". Box Office Mojo. March 19, 2017. Archived from the original on June 23, 2011. Retrieved March 19, 2017. ^ Nancy Tartaglione (March 19, 2017). "'Beauty and the Beast' Enchants With $350M Global Bow; $180M Offshore – International Box Office". Deadline Hollywood. Archived from the original on September 10, 2017. Retrieved March 19, 2017. ^ Nancy Tartaglione. "'Beauty and the Beast' Makes Room For $222M Offshore, $429M WW on Tuesday". March 22, 2017. Archived from the original on September 10, 2017. Retrieved March 23, 2017. ^ "'Beauty and the Beast' Crosses $500M at Worldwide Box Office". Archived from the original on September 10, 2017. ^ a b c Anthony D'Alessandro (March 19, 2017). "'Beauty and the Beast' Twirling To $174M+; Beats 'Harry Potter' & 'Batman V. Superman'; Can It Go Higher? – Sunday Final". Deadline Hollywood. Archived from the original on March 20, 2017. Retrieved March 19, 2017. ^ Brooks Barnes (March 19, 2017). "'Beauty and the Beast' Clobbers Record With $170 Million Opening". The New York Times. Archived from the original on March 20, 2017. Retrieved March 20, 2017. ^ Sarah Whitten (March 17, 2017). "'Beauty and the Beast' could be Disney's first $1 billion film of 2017". CNBC. Archived from the original on March 19, 2017. Retrieved March 20, 2017. ^ Pamela McClintock (March 20, 2017). "'Beauty and the Beast's' Secret to Success: Female Power and Comfort". The Hollywood Reporter. Archived from the original on March 20, 2017. Retrieved March 20, 2017. ^ Nathan McAlonemar (March 21, 2017). "'Beauty and the Beast' could make $1.5 billion at the box office, and it has big implications for Disney's future". Business Insider. Archived from the original on March 23, 2017. Retrieved March 23, 2017. ^ Pamela McClintock (April 12, 2017). "Box-Office Milestone: 'Beauty and the Beast' Waltzing Past $1B Globally". The Hollywood Reporter. Archived from the original on April 12, 2017. Retrieved April 13, 2017. ^ Dave McNarry (April 12, 2017). "'Beauty and the Beast' to Cross $1 Billion at Worldwide Box Office". Variety. Archived from the original on April 13, 2017. Retrieved April 13, 2017. ^ a b Nancy Tartaglione (April 13, 2017). "'Beauty and the Beast' Roars Past $1B at Worldwide Box Office". Deadline Hollywood. Archived from the original on September 10, 2017. Retrieved April 13, 2017. ^ "2017 WORLDWIDE GROSSES". Box Office Mojo. Archived from the original on April 12, 2017. Retrieved April 13, 2017. ^ "TOP OPENING WEEKENDS BY MONTH – MARCH". Box Office Mojo. Archived from the original on March 16, 2015. Retrieved April 13, 2017. ^ a b Tom Grater (April 22, 2017). "How well do Hollywood remakes fare at the box office?". Screen Daily. Archived from the original on April 23, 2017. Retrieved April 23, 2017. ^ "WORLDWIDE GROSSES". Box Office Mojo. Archived from the original on July 16, 2001. Retrieved May 21, 2017. ^ D'Alessandro, Anthony (March 27, 2018). "No. 2 'Beauty and the Beast' Box Office Profits – 2017 Most Valuable Blockbuster Tournament". Deadline Hollywood. Retrieved March 27, 2018. ^ Anthony D'Alessandro (February 23, 2017). "'Beauty and the Beast' Roars on to Tracking, Looking to Shake Up March Records – Box Office Projection". Deadline Hollywood. Archived from the original on September 10, 2017. Retrieved March 4, 2017. ^ Pamela McClintock (March 14, 2017). "'Beauty and the Beast' Sets New Record for Advance Ticket Sales". The Hollywood Reporter. Archived from the original on September 10, 2017. Retrieved March 15, 2017. ^ Pamela McClintock (March 16, 2017). "Box-Office Preview: Will 'Beauty and the Beast' Waltz to New Records?". The Hollywood Reporter. Archived from the original on September 10, 2017. Retrieved March 16, 2017. ^ Anthony D'Alessandro (March 6, 2017). "Proof That 'Beauty and the Beast' Will Tear Up March B.O. Records: Pre-Sales Are Through The Roof". Deadline Hollywood. Archived from the original on September 10, 2017. Retrieved March 7, 2017. ^ Ryan Faughnder (March 15, 2017). "Why 'Beauty and the Beast' will be the biggest box-office hit of the year so far". Los Angeles Times. Archived from the original on September 10, 2017. Retrieved March 15, 2017. ^ Brian Gallagher (March 17, 2017). "Beauty and the Beast Roars Loudly with $16.3M at Thursday Box Office". Movie Web. Archived from the original on March 17, 2017. Retrieved March 17, 2017. ^ Anthony D'Alessandro (March 17, 2017). "'Beauty and the Beast' Gorgeous on Thursday With $16.3M, Beats 'Furious 7' – Friday AM Update". Deadline Hollywood. Archived from the original on March 20, 2017. Retrieved March 17, 2017. ^ Scott Mendelson (March 17, 2017). "Box Office: 'Beauty And The Beast' Nabs Monstreous $16.3M Thursday". Forbes. Archived from the original on March 17, 2017. Retrieved March 17, 2017. ^ Seth Kelley (March 18, 2017). "Box Office: 'Beauty and the Beast' Belts Out $64 Million on Friday". Variety. Archived from the original on March 18, 2017. Retrieved March 18, 2017. ^ Anthony D'Alessandro (March 18, 2017). "'Beauty and the Beast' Dazzling With $173M+ Opening; Bound To Set Records For Pre-Summer, Bill Condon & Emma Watson". Deadline Hollywood. Archived from the original on March 20, 2017. Retrieved March 18, 2017. ^ Scott Mendelson (March 18, 2017). "Box Office: 'Beauty And The Beast' Waltzes To Beastly $64M Friday For Possible $170M+ Weekend". Forbes. Archived from the original on March 18, 2017. Retrieved March 18, 2017. ^ a b Scott Mendelson (March 20, 2017). "Box Office: Disney's 'Beauty And The Beast' Debut Topped 'Batman V Superman' And 'Iron Man 3'". Forbes. Archived from the original on September 10, 2017. Retrieved March 20, 2017. ^ "TOP OPENING WEEKENDS BY MONTH – MARCH". Box Office Mojo. Archived from the original on March 16, 2015. Retrieved March 20, 2017. ^ "TOP OPENING WEEKENDS BY SEASON – SPRING". Box Office Mojo. Archived from the original on March 19, 2017. Retrieved March 20, 2017. ^ "TOP OPENING WEEKENDS BY MPAA RATING". Box Office Mojo. Archived from the original on March 20, 2017. Retrieved March 20, 2017. ^ a b c Pamela McClintock (March 19, 2017). "'Beauty and the Beast' Box Office: 5 Biggest Records Broken". The Hollywood Reporter. Archived from the original on September 10, 2017. Retrieved March 20, 2017. ^ Scott Mendelson (March 19, 2017). "Box Office: 'Beauty And The Beast' Nabs Record $170M U.S., $350M Global Debut". Forbes. Archived from the original on March 19, 2017. Retrieved March 19, 2017. ^ a b Jake Coyle (March 19, 2017). "'Beauty and the Beast' roars to No. 1 with monstrous $170M in box office". USA Today. Archived from the original on March 19, 2017. Retrieved March 20, 2017. ^ a b Brent Lang (March 19, 2017). "'Beauty and the Beast': 5 Reasons the Disney Fantasy Scored at the Box Office". Variety. Archived from the original on March 20, 2017. Retrieved March 20, 2017. ^ Anthony D'Alessandro (March 21, 2017). "'Beauty and the Beast' Continues B.O. Dance With Second-Best Monday in March". Deadline Hollywood. Archived from the original on March 22, 2017. Retrieved March 21, 2017. ^ Anthony D'Alessandro (March 22, 2017). "'Beauty and the Beast' Hits A High Note With Best Pre-Summer Tuesday, Crosses $200M". Deadline Hollywood. Archived from the original on March 22, 2017. Retrieved March 22, 2017. ^ "Box Office: 'Beauty And The Beast' Ends First Week Just Below $500M". Archived from the original on March 26, 2017. ^ "TOP WEEKENDS: 2ND – 12TH". Box Office Mojo. Archived from the original on December 2, 2009. Retrieved March 27, 2017. ^ "BOX OFFICE TOP 20: 'BEAUTY' ADDS $90.4 MILLION IN WEEKEND 2". Associated Press. Archived from the original on March 29, 2017. ^ Joey Nolfi (March 26, 2017). "Box office report: Beauty and the Beast doubles Power Rangers' weekend gross". Entertainment Weekly. Archived from the original on March 28, 2017. Retrieved March 29, 2017. ^ "'Boss Baby' Cleans 'Beauty and the Beast's Clock with $51M+ Opening; 'Ghost' Shell-Shocked at $20M+". Deadline Hollywood. Archived from the original on April 1, 2017. Retrieved April 2, 2017. ^ "'Beauty and the Beast' Enchants $900M at WW Box Office; Crosses $400M Domestic". Deadline Hollywood. Archived from the original on September 10, 2017. Retrieved April 6, 2017. ^ Scott Mendelson (April 7, 2017). "Box Office: 'Beauty and the Beast' Ends Week Three with $920 Million". Deadline Hollywood. Retrieved April 11, 2017. ^ Emma Stefansky (April 30, 2017). "How a Flashy Blockbuster and an Indian Fantasy Bested Emma Watson at the Box Office". Vanity Fair. Archived from the original on September 10, 2017. Retrieved May 1, 2017. ^ Anthony D'Alessandro (April 30, 2017). "'Latin Lover' Sets $12M Pantelion Record, 'Baahubali 2' Mighty With $10M+, 'Circle' Is A Square As 'F8' Leads Listless Weekend". Deadline Hollywood. Archived from the original on September 10, 2017. Retrieved May 1, 2017. ^ Hill, Libby (December 31, 2017). "'Star Wars: The Last Jedi' unseats 'Beauty and the Beast' as highest-grossing film of 2017". Los Angeles Times. Archived from the original on December 31, 2017. Retrieved January 1, 2018. ^ The Associated Press (December 31, 2017). "'Star Wars: The Last Jedi' passes 'Beauty and the Beast' as top 2017 earner". New York Daily News. Archived from the original on December 31, 2017. Retrieved January 1, 2018. ^ Scott Mendelson (May 28, 2017). "Box Office: 'Alien: Covenant' Suffers Brutal 71% Drop As 'Guardians 2' Tops 'Guardians'". Forbes. Archived from the original on August 8, 2017. Retrieved May 28, 2017. ^ Seth Kelley (May 28, 2017). "'Beauty and the Beast' Crosses $500 Million Milestone at Domestic Box Office". Variety. Archived from the original on May 28, 2017. Retrieved May 28, 2017. ^ Seth Kelley (July 23, 2017). "Why 'Wonder Woman' and 'Beauty and the Beast' Should Lead to More Female-Centered Films". Variety. Archived from the original on August 13, 2017. Retrieved August 13, 2017. ^ Anthony D'Alessandro (December 31, 2017). "'Last Jedi', 'Jumanji' Propelling 2017 Box Office To $11B+ Year – AM Update". Deadline Hollywood. Archived from the original on December 31, 2017. Retrieved December 31, 2017. ^ Scott Mendelson (April 12, 2017). "Box Office: 'Beauty And The Beast' Should Cross $1 Billion Today". Forbes. Retrieved April 13, 2017. ^ "Musical". Box Office Mojo. Archived from the original on May 23, 2017. Retrieved May 29, 2017. ^ "2017 DOMESTIC GROSSES". Box Office Mojo. Archived from the original on April 13, 2017. Retrieved April 13, 2017. ^ a b c d Nancy Tartaglione (March 20, 2017). "'Beauty and the Beast' A$1B Belle WW? : Bow Enchants With Bigger $357M Global, $182M Offshore – International Box Office". Deadline Hollywood. Archived from the original on September 10, 2017. Retrieved March 21, 2017. ^ a b c d "'Beauty and the Beast' Nears $700M WW; 'Kong' Has Mighty $72M China Bow, Tops $250M Offshore – International Box Office". Archived from the original on March 27, 2017. ^ Nancy Tartaglione (April 2, 2017). "'Beauty' Is $876M Beast WW; 'Ghost in the Shell' Sells $40M Offshore; 'Kong' Sets WB China Record – International Box Office". Deadline Hollywood. Archived from the original on September 10, 2017. Retrieved April 4, 2017. ^ a b Nancy Tartaglione (April 9, 2017). "'Ghost in the Shell' Rises To $93M Offshore; 'Beauty and the Beast' Tops $977M Global – International Box Office". Deadline Hollywood. Archived from the original on September 10, 2017. Retrieved April 11, 2017. ^ Nancy Tartaglione (March 18, 2017). "'Beauty and the Beast' A Monster With $52M Offshore Through Friday, $115.6M Global – International Box Office". Deadline.com. Archived from the original on March 18, 2017. Retrieved March 18, 2017. ^ "'Beauty and the Beast' continues box-office reign". Korea JoongAng Daily. March 28, 2017. Archived from the original on March 28, 2017. Retrieved March 28, 2017. ^ Charles Gant (March 21, 2017). "Beauty and the Beast waltzes its way to the top of the UK box office". The Guardian. Archived from the original on March 21, 2017. Retrieved March 22, 2017. ^ (Press Release) (March 19, 2017). "Beauty and the Beast smashes the box office in opening weekend". The Guardian. Archived from the original on March 21, 2017. Retrieved March 22, 2017. ^ "Beauty and the Beast magic helps UK box office survive the spring sunshine". Archived from the original on March 28, 2017. ^ "Beauty & The Beast Opens Better Than Aa Gaya Hero, Trapped, Machine & Mantra". Koimoi. March 17, 2017. Archived from the original on March 17, 2017. Retrieved March 17, 2017. ^ "Beauty and the Beast Opens Better Than Hindi Releases". Box Office India. March 17, 2017. Archived from the original on March 20, 2017. Retrieved March 17, 2017. ^ Don Groves (March 17, 2017). "Rajkummar Rao Faces A Lone Battle For Survival In 'Trapped'". Forbes. Archived from the original on March 16, 2017. Retrieved March 17, 2017. ^ "Beauty and the Beast Beats Hindi Films Combined". Box Office India. March 18, 2017. Archived from the original on March 20, 2017. Retrieved March 19, 2017. ^ Don Groves (March 19, 2017). "Varun Dhawan and Alia Bhatt Outrun 'Beauty and the Beast' To Reign Again in India". Forbes. Archived from the original on March 20, 2017. Retrieved March 20, 2017. ^ "'Beauty and the Beast' box-office collection first weekend". The Times of India. March 20, 2017. Retrieved March 20, 2017. ^ "Beauty & The Beast Enjoys A Good 1st Weekend at the Box Office in India". Koimoi.com. March 20, 2017. Archived from the original on March 20, 2017. Retrieved March 20, 2017. ^ Brent Lang (March 19, 2017). "'Beauty and the Beast' Debuts to Magical $350 Million Globally". Variety. Archived from the original on March 19, 2017. Retrieved March 19, 2017. ^ Jonathan Papish (March 15, 2017). "On Screen China: 'Beauty' Looks Like a Beast". China Film Insider. Archived from the original on March 18, 2017. Retrieved March 17, 2017. ^ a b Jonathan Papish (March 22, 2017). "China Box Office: First Place For 'Beauty' Still Less Than Best". China Film Insider. Archived from the original on March 23, 2017. Retrieved March 23, 2016. ^ Patrick Frater (March 17, 2017). "'Beauty and the Beast' Opens Strong in China With 'Gay Moment' Intact". Variety. Archived from the original on March 17, 2017. Retrieved March 17, 2017. ^ Patrick Brzeski (March 19, 2017). "China Box Office: 'Beauty and the Beast' Opens to $45M, With Gay Moment Uncut". The Hollywood Reporter. Archived from the original on March 20, 2017. Retrieved March 20, 2017. ^ Patrick Frater (March 19, 2017). "China Box Office: 'Beauty' Dominates Weekend". Variety. Archived from the original on March 20, 2017. Retrieved March 20, 2017. ^ a b c Nancy Tartaglione (April 23, 2017). "'Fate of the Furious' Fires Up $745M Offshore, $908M WW; Tops 'Transformers' In China – International Box Office". Deadline Hollywood. Archived from the original on September 10, 2017. Retrieved April 23, 2017. ^ Mark Schilling (April 23, 2017). "Japan Box Office: 'Beauty and the Beast' Opens Strongly Ahead of Golden Week". Variety. Archived from the original on April 25, 2017. Retrieved April 24, 2017. ^ Russell Edwards (April 25, 2017). "Beast is Best in Japan; Fast & Furious drives China, Korea". Asia Times. Archived from the original on April 25, 2017. Retrieved April 25, 2017. ^ a b Tartaglione (April 30, 2017). "'Guardians of the Galaxy Vol 2' Zooms With $101.2M Bow – International Box Office". Deadline Hollywood. Archived from the original on September 10, 2017. Retrieved April 30, 2017. ^ Nancy Tartaglione (May 7, 2017). "'Guardians 2' Notches $428M Global, Lifts MCU Past $11B; 'Furious 8' Tops $950M Offshore – International Box Office". Deadline Hollywood. Archived from the original on May 9, 2017. Retrieved May 7, 2017. ^ Scott Mendelson (May 14, 2017). "Box Office: 'Guardians 2' Snags $63M Weekend For $631M Worldwide". Forbes. Retrieved May 14, 2017. ^ "Japan Yearly Box Office (2017)". Box Office Mojo. Archived from the original on July 7, 2017. Retrieved May 8, 2017. ^ a b Nancy Tartaglione (June 5, 2017). "'Wonder Woman' Leaps To $125M Offshore, $228M Global Debut – International Box Office". Deadline Hollywood. Archived from the original on June 5, 2017. Retrieved June 6, 2017. ^ Nancy Tartaglione (June 12, 2017). "'The Mummy' Unearths $141M Offshore, $172.3M Global; 'Wonder Woman' Flies To $232M at International Box Office". Deadline Hollywood. Archived from the original on June 11, 2017. Retrieved June 13, 2017. ^ Charles Gant (April 11, 2017). "The Boss Baby makes a dummy of UK box-office competition". The Guardian. Archived from the original on September 10, 2017. Retrieved April 12, 2017. ^ "'Beauty and the Beast' smashes Philippines' all-time box office records". The Philippine Star. April 13, 2017. Archived from the original on April 13, 2017. Retrieved April 13, 2017. ^ Charles Gant (April 19, 2017). "Fast & Furious 8 barrels past Boss Baby to top of UK box office". The Guardian. Archived from the original on September 10, 2017. Retrieved April 20, 2017. ^ Charles Gant (May 3, 2017). "Guardians of the Galaxy Vol 2 blows away UK box office with huge debut". The Guardian. Archived from the original on September 10, 2017. Retrieved May 3, 2017. ^ Nancy Tartaglione and Anita Busch (April 16, 2017). "'Fate of the Furious' Smokes Records With $432.3M Overseas Bow; $532.5M Worldwide – International Box Office". Deadline Hollywood. Archived from the original on September 10, 2017. Retrieved April 17, 2017. ^ "Beauty and the Beast (2017)". Rotten Tomatoes. Fandango Media. Archived from the original on December 11, 2017. Retrieved March 18, 2019. ^ "Beauty and the Beast Reviews". Metacritic. CBS Interactive. Archived from the original on April 14, 2017. Retrieved April 14, 2017. ^ "Beauty and the Beast". CinemaScore on Twitter. March 17, 2017. Archived from the original on September 10, 2017. Retrieved April 10, 2016. ^ Anthony D'Alessandro (March 17, 2017). "'Beauty and the Beast' Dazzling With $169M+ Opening; Bound To Set Records For Pre-Summer, Bill Condon & Emma Watson". Deadline Hollywood. Archived from the original on March 20, 2017. Retrieved March 18, 2017. ^ Felperin, Leslie (March 3, 2017). "'Beauty and the Beast': Film Review". The Hollywood Reporter. Archived from the original on April 22, 2017. Retrieved April 23, 2017. ^ Gleiberman, Owen (March 3, 2017). "Film Review: 'Beauty and the Beast'". Variety. Archived from the original on March 3, 2017. Retrieved March 3, 2017. ^ "Review: 'Beauty and the Beast' Revels in Joy and Enchantment". The New York Times. A. O. Scott. March 3, 2017. Archived from the original on September 10, 2017. ^ "Remake of 'Beauty and the Beast' convincingly springs to life". The Washington Post. Ann Hornaday. March 16, 2017. Archived from the original on September 10, 2017. ^ Richard Roeper (March 15, 2017). "Lavish 'Beauty and the Beast' true as it can be to original". Chicago Sun-Times. Archived from the original on September 10, 2017. Retrieved April 26, 2017. ^ "The New 'Beauty and the Beast' Should Satisfy Most Fans". Uproxx. March 3, 2017. Archived from the original on September 10, 2017. Retrieved March 14, 2017. ^ Churnin, Nancy (March 15, 2017). "'Beauty and the Beast' brings fresh resonance to 'a tale as old as time'". The Dallas Morning News. Archived from the original on July 18, 2017. Retrieved May 31, 2017. ^ Berardinelli, James (March 15, 2017). "Beauty and the Beast (United States, 2017)". Reelviews. Archived from the original on June 29, 2017. Retrieved October 10, 2017. ^ "Review: Rousing new 'Beauty and the Beast' is even better than the original". USA Today. Brian Truitt. March 17, 2017. Archived from the original on April 22, 2017. ^ Peter Travers (March 17, 2017). "'Beauty and the Beast' Review: Live-Action Disney Classic Still Tale as Old as Time". Rolling Stone. Archived from the original on September 10, 2017. Retrieved April 24, 2017. ^ Zacharek, Stephanie (March 4, 2017). "REVIEW: The Reimagined Beauty and the Beast Is Wild, Vivid and Crazy-Beautiful". Time. Archived from the original on April 26, 2017. Retrieved April 26, 2017. ^ LaSalle, Mick (March 13, 2017). "Enchanting 'Beauty and the Beast' looks like a winner". San Francisco Chronicle. Archived from the original on April 29, 2017. Retrieved April 28, 2017. ^ Robey, Tim (March 17, 2017). "Beauty and the Beast review: Emma Watson dazzles in Disney's show-stopping chocolate box of a remake". The Daily Telegraph. London. Archived from the original on March 17, 2017. Retrieved March 17, 2017. ^ "'Beauty and the Beast' Magically Modernizes Classic Disney Fairy Tale". Forbes. Mark Hughes. March 17, 2017. Archived from the original on April 24, 2017. ^ Whitty, Stephen (March 3, 2017). "'Beauty and the Beast' a magical delight with Emma Watson: movie review". New York Daily News. Archived from the original on December 1, 2017. Retrieved November 30, 2017. ^ "'Beauty and the Beast' review: Animated Disney musical's charms lost in translation". Chicago Tribune. March 14, 2017. Archived from the original on September 10, 2017. Retrieved March 14, 2017. ^ Bradshaw, Peter (March 3, 2017). "Beauty and the Beast review – Emma Watson makes a perfect Belle in sugar-rush romance". The Guardian. Archived from the original on April 28, 2017. Retrieved April 28, 2017. ^ Ide, Wendy (March 19, 2017). "Beauty and the Beast review – gilt complex". The Guardian. Archived from the original on April 27, 2017. Retrieved April 28, 2017. ^ Chris Nashawaty (March 3, 2017). "Beauty and the Beast: EW review". Entertainment Weekly. Archived from the original on September 10, 2017. Retrieved April 26, 2017. ^ Staff, Variety (January 23, 2018). "Oscar Nominations 2018: The Complete List". Variety. Retrieved January 23, 2018. ^ ""Lady Bird," "Call Me By Your Name" win big for Chicago film critics". Chicago Film Critics Association. Archived from the original on December 13, 2017. Retrieved December 13, 2017. ^ "CDG Awards Nominations Announced For Film & TV Costuming". Deadline. January 10, 2018. Retrieved January 10, 2018. ^ Johnson, Zach (December 6, 2017). "Critics' Choice Awards 2018: Complete List of Movie and TV Nominations". E!. ^ "The 18th Annual Golden Trailer Award Nominees". GoldenTrailer.com. Archived from the original on September 10, 2017. Retrieved September 6, 2017. ^ Beachum, Chris (November 3, 2017). "Hollywood Film Awards 2017: Complete list of winners for Sunday's ceremony includes Kate Winslet, Jake Gyllenhaal, Allison Janney, Sam Rockwell". Goldderby.com. Archived from the original on November 7, 2017. Retrieved November 4, 2017. ^ Pond, Steve (October 26, 2017). "Hollywood Music in Media Awards Announces Nominees in Film, TV, & Video Game Music". Shoot Online. Archived from the original on October 26, 2017. Retrieved October 26, 2017. ^ "Hollywood Music in Media Awards: Full Winners List". The Hollywood Reporter. November 11, 2017. Archived from the original on December 1, 2017. Retrieved November 18, 2017. ^ "'Beauty and the Beast,' 'Guardians 2' Among HPA Awards Nominees". The Hollywood Reporter. Archived from the original on December 10, 2017. Retrieved October 16, 2017. ^ "HPA Awards: 'Dunkirk' Wins Best Editing in a Feature". The Hollywood Reporter. Archived from the original on December 1, 2017. Retrieved November 18, 2017. ^ "'The Shape of Water' inundates Houston critics' film awards nominations". Houston Chronicle. December 12, 2017. Archived from the original on December 13, 2017. Retrieved December 12, 2017. ^ "NAACP Image Awards: 'Marshall,' 'Get Out,' 'Girls Trip' Dominate Film Nominations". The Hollywood Reporter. November 20, 2017. Archived from the original on December 1, 2017. Retrieved November 21, 2017. ^ Farber, Lindsay (February 26, 2018). "Nickelodeon's Kids' Choice Awards 2018: Watch Host John Cena Announce the Favorite Movie Nominees". E! News. Retrieved March 6, 2018. ^ Hipes, Patrick (March 2, 2018). "Publicists Guild Awards: 'Get Out', 'Stranger Things 2', Deadline's Mike Fleming Jr. Among Winners". Deadline Hollywood. Retrieved March 6, 2018. ^ "2017 San Diego Film Critics Society Award Winners". San Diego Film Critics Society. December 11, 2017. Archived from the original on December 12, 2017. Retrieved December 13, 2017. ^ "'Dunkirk,' 'The Shape of Water' Lead Satellite Award Nominations". The Wrap. November 29, 2017. Archived from the original on November 30, 2017. Retrieved November 29, 2017. ^ McNary, Dave (March 15, 2018). "'Black Panther,' 'Walking Dead' Rule Saturn Awards Nominations". Variety. Retrieved March 16, 2018. ^ ""Get Out" Named Best Picture of 2017 by Seattle Film Critics Society". Seattle Film Critics Society. December 18, 2017. Archived from the original on December 12, 2017. ^ "2017 StLFCA Annual Award Winners". St. Louis Film Critics Association. December 17, 2017. Archived from the original on May 4, 2016. Retrieved December 17, 2017. ^ Ramos, Dino-Ray (August 13, 2017). "Teen Choice Awards 2017 Winners: 'Wonder Woman', 'Beauty And The Beast', 'Riverdale' Among Honorees". Deadline Hollywood. enske Business Media, LLC. Archived from the original on August 14, 2017. Retrieved August 14, 2017. ^ "The 2017 WAFCA Awards". Washington D.C. Area Film Critics Association. December 7, 2017. Archived from the original on March 12, 2017. Retrieved December 6, 2017. ^ Neglia, Matt (December 12, 2017). "The 2017 Women Film Critics Circle (WFCC) Nominations". Archived from the original on December 13, 2017. Retrieved December 13, 2017. ^ Neglia, Matt (December 22, 2017). "The 2017 Women Film Critics Circle (WFCC) Winners". Archived from the original on December 26, 2017. Retrieved December 25, 2017. ^ "'Beauty and the Beast's 'gay moment' may have been much ado about nothing". USA Today. March 20, 2017. Archived from the original on September 10, 2017. Retrieved March 21, 2017. ^ "Bill Condon on Beauty and the Beast, His Musical Influences, and Lindsay Lohan's Plan for The Little Mermaid". Vulture. March 15, 2017. Archived from the original on April 19, 2017. Retrieved March 19, 2017. ^ Ned Ehrbar (March 17, 2017). "GLAAD president: "Beauty and the Beast" foes are "outliers"". CBS News. Archived from the original on April 19, 2017. Retrieved March 17, 2017. ^ "Russia May Ban Disney's 'Beauty and the Beast' Over Gay Character". Variety. March 4, 2017. Archived from the original on March 4, 2017. Retrieved March 5, 2017. ^ "Russia won't ban Beauty and the Beast—but will have an age restriction". Entertainment Weekly. March 6, 2017. Archived from the original on September 10, 2017. Retrieved March 7, 2017. ^ "Alabama Theater Won't Show 'Beauty and the Beast' Because of Gay Subplot". The Huffington Post. Archived from the original on March 6, 2017. Retrieved March 3, 2017. ^ Cheang, Michael (March 13, 2017). "Beauty and the Beast release postponed for 'internal review'". The Star Online. Archived from the original on March 14, 2017. Retrieved March 15, 2017. ^ "Disney pulls Beauty and the Beast from cinemas in Malaysia 'until further notice'". Digital Spy. March 13, 2017. Archived from the original on September 10, 2017. Retrieved March 13, 2017. ^ "Disney refuses to cut 'gay moment' from 'Beauty and the Beast' for Malaysia". Malay Mail Online. March 15, 2017. Archived from the original on September 10, 2017. Retrieved March 15, 2017. ^ Mia Galuppo (March 15, 2017). "Disney Defies Malaysia Censors, Won't Cut 'Beauty and the Beast' Gay Moment". The Hollywood Reporter. Archived from the original on September 10, 2017. Retrieved March 16, 2017. ^ Patrick Brzeski (March 21, 2017). "Malaysia Clears Release of 'Beauty and the Beast,' with 'Gay Moment' Intact". The Hollywood Reporter. Archived from the original on September 10, 2017. Retrieved March 21, 2017. ^ "Film Appeal Committee's decision to release Beauty and the Beast". The Star Online. March 21, 2017. Archived from the original on September 10, 2017. Retrieved March 30, 2017. ^ "Beauty and the Beast pulled from cinemas in Kuwait". BBC. March 21, 2017. Archived from the original on March 28, 2017. Retrieved March 30, 2017. ^ Houlihan, Ryan. "Disney Making LeFou Gay Isn't the Representation I Need". Teen Vogue. Archived from the original on October 21, 2017. Retrieved October 21, 2017. ^ "How Beauty and the Beast & Power Rangers Cheated Gay Fans". Screen Rant. April 2, 2017. Archived from the original on October 21, 2017. Retrieved October 21, 2017. ^ "Cautiously Guarded About Beauty and the Beast's LeFou Being Disney's "First Gay Character"". www.themarysue.com. Archived from the original on October 21, 2017. Retrieved October 21, 2017. ^ "GLAAD Report Says LGBTQ People Are "Nearly Invisible" in Hollywood". Flare. March 1, 2017. Archived from the original on January 4, 2018. Retrieved October 21, 2017. ^ Watkins, Gwynne (March 2, 2017). "'Beauty and the Beast' Featurette Makes a Case for Feminist Belle". Yahoo Movies. Archived from the original on April 19, 2017. Retrieved March 26, 2017. ^ Williams, Zoe (March 19, 2017). "Beauty and the Beast: feminist or fraud". The Guardian. Archived from the original on April 19, 2017. Retrieved March 26, 2017. ^ Blasberg, Derek (February 28, 2017). "Cover Story: Emma Watson, Rebel Belle". Vanity Fair. Archived from the original on February 28, 2017. Retrieved March 27, 2017. ^ Breznican, Anthony (February 16, 2017). "Beauty and the Beast: Emma Watson addresses questions over Beast relationship". Entertainment Weekly. Archived from the original on September 10, 2017. Retrieved March 26, 2017. ^ Watkins, Gwynne (March 20, 2017). "Does Belle From 'Beauty and the Beast' Suffer From Stockholm Syndrome? We Asked an Expert". Yahoo Movies. Archived from the original on September 10, 2017. Retrieved March 26, 2017. ^ Durvasula, Ramani (March 23, 2017). "Does Belle from Beauty and The Beast Have Stockholm Syndrome?". Screen Junkies. Archived from the original on April 7, 2017. Retrieved March 26, 2017. ^ Simon, Rachel (March 16, 2017). "The 'Beauty and the Beast' Relationship Isn't "Stockholm Syndrome," No Matter How Screwed Up It May Be". Bustle. Archived from the original on September 10, 2017. Retrieved March 26, 2017. ^ Grady, Constance (March 23, 2017). "Is Beauty and the Beast "a tale as old as Stockholm syndrome"? Depends how you read it". Vox. Archived from the original on September 10, 2017. Retrieved March 26, 2017. ^ Menta, Anna. "The 'Beauty and the Beast' Love Story Doesn't Hold Up To Emma Watson's Feminism". Elite Daily. Archived from the original on September 10, 2017. Retrieved March 26, 2017. Wikimedia Commons has media related to Beauty and the Beast (2017 film).